This is one of the “project Phenix” carried by the city of Charleroi and financed by European and Walloon funds. The project consists of the construction of an Urban Distribution Center (2000 m²), CDU in French, in which goods from intra-ring shops are deposited by haulers to be transported by light electric vehicles to stores. The main problem related to the CDU is the collision between this dual scales in which it fits; that specific to infrastructure and that of the surrounding urban fabric. The site is quite stretched in length, surrounded by heavy infrastructures: metro, railway and the ring. If we look at them from a purely scenographic point of view, we can find them dramatically beautiful and develop an architecture that becomes their extension. Formally the project consists of two “aerial beams” that extend voluntarily to the ends of the adjacent island. An urban project that dances with all its infrastructures to appropriate the spaces generated by them. The beams offer a coherent vision from the ring: a strong line of 120 m in length and 5 m in height treating the entire space. 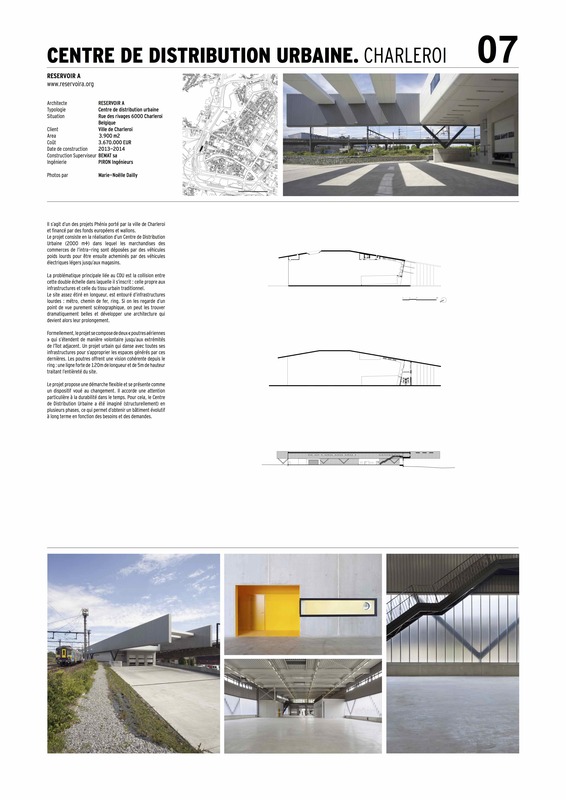 The project proposes a flexible approach and presents itself as a vice dedicated to change. It pays special attention to its sustainability over time. For this, the Urban Distribution Center has been conceived (structurally) in several phases, which makes it possible to obtain a long-term evolving building according to needs and requests.